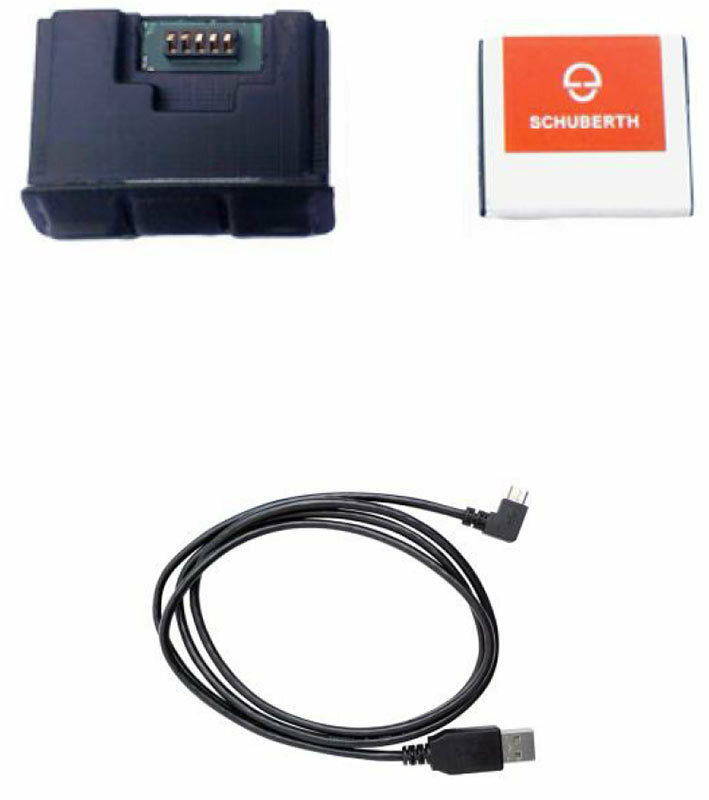 Wir senden Ihnen einmalig eine E-Mail an die Adresse , sobald das Produkt Schuberth SC1 Advanced Kommunikationsystem verfügbar ist. Kommunizieren, telefonieren, navigieren, Musik hören – auch auf dem Motorrad wird Kommunikation jetzt ganz einfach. Installation kinderleicht und unsichtbare Technik: die Kommunikationseinheit wird in die Helmschale geklinkt und ist somit voll im Helm integriert. Mikrofon und Lautsprecher sind übrigens serienmäßig in C4 und R2 vorinstalliert. Das neue SCHUBERTH Kommunikationssystem SC1. Klein, leicht und voll in der Helmschale integriert. Einfache Montage durch Plug'n Play. In der "Standard" und "Advanced" Ausführung. Die Installation des neuen SCHUBERTH Kommunikationssystems SC1 Standard und SC1 Advanced ist denkar einfach. Stecken Sie die Kommunikationseinheit und den Akku in die dafür vorgesehenen Slots und fertig. Sprechzeit: bis zu 14 Std. Communicating, talking on the phone, using the satnav, listening to music – communication now also becomes very simple on the motorbike. Extremely easy installation and invisible technology: the communication unit is slotted into the edge of the helmet and is completely hidden. Microphone and speakers are preinstalled in the helmet. The new SCHUBERTH Communication Sytem SC1. Small, lightweight and fully integrated in the outer helmet shell. Easy to install by plug&play. Available in two versions „Standard“and „Advanced“. Fully integrated antenna in the outer helmet shell. Installation of the new SCHUBERTH SC1 is very easy. Remove the cover at the back of the helmet, flick communication unit and battery in the slots and ready. Een minpunt is toch de bediening, deze is erg complex en de diversiteit van het menu misschien iets te groot. Clear phone communications. Buttons too small and extremely difficult/almost impossible to use. The conection to my mobile is fine. Battery doesn't last as long as other brands I have used. Radio does not work at all. No solution from Sena. Har inte kört med hjälmen eller SC1 men kan i detta läge säga att det är lätt att installera, ljudet är fantastiskt. Schubert hjälmen ger ett mycket gott intryck, dock kan skyddet under hakan kännas lite tajt och ovanligt men tror att man vänjer sig. The idea of having integrated communications seemed great, this implementation doesn't work well. The buttons are tricky to press with gloves on, connectivity is difficult (many of the guys I ride with have Sena) and generally frustrating. The C4 helmet is great, why put rubbish communications system in it Schuberth? Die Anbindung die Komponenten (Handy, Navi und 2. Helm haben problemlos geklappt. Erste Erfahrungen im Handling stehen noch aus. Buon prodotto, facile da montare sul casco, mi aspettavo qualcosa in più sulla connettività verso il mondo non "SENA". pazienza. Avendo solo un casco Schuberth non lo uso come l'interfono, comunque suono chiaro anche a velocità autostradale. Sono complessivamente soddisfatto. Die Bedienung über die nur zwei Tasten mit sämtlichen Kombinationen und Reihenfolgen erfordert leider etwas Eingewöhnung. Nachdem man es verstanden hat ist die Bedienung, auch während der Fahrt, kein Problem. Der Klang vom RDS-Radio und via BT (Musik, Navi) ist wirklich recht gut und telefonieren funktioniert ebenfalls prima. Gegensprechen mit anderen Personen konnte ich leider noch nicht testen. Abstriche muss man naturgemäß bei höheren Geschwindigkeiten machen, da die Windgeräusche folglich gegen die Lautstärke der Lautsprecher arbeiten. Wichtig ist noch ggf. die Lautsprecher im Helm so zu verschieben, dass die Ohrmuschel korrekt getroffen wird. Alles in Allem eine Empfehlung wert! Ich vergebe 4 Sterne wegen der Bedienung. Excelente integração com o capacete C4. Os botões são algo pequenos para uso com luvas de inverno. A qualidade sonora é excelente. Globalmente é um produto recomendado. This product is very comfortable to use bluetooth. C'est un bon système de communication invisible et performant dans l'ensemble ! Néanmoins, ce produit SENA avec RADIO ne me permet pas encore d’avoir les instructions vocales du téléphone par Bluetooth provenant d’application GPS ou autre si la radio est activée. SENA aurait donc priorisé la radio par rapport aux informations de sécurité pour le motard. Mauvaise configuration ? Mauvais réglage ? Attente d'une nouvelle MAJ... ? Design concept of integration into the helmet deserves some points I think. Some best designs are ones you can't tell are there. Still testing Bluetooth fxn. Feels like folks purchasing this relatively high-priced item are subsidizing the cost of the integrated antenna and speakers in all C4 helmets for those who don't buy the SC-1. Leicht bedienbar und gut in den Helm integriert. Empfehlenswert. Der Einbau in den. 4 war ein Kinderspiel. Das koppeln mit IPhone und Navigator 6 funktionierte auf Anhieb. Bisher keine Verbindungsabbrüche. Der Radioempfang ist gut. das Vornehmen von Änderungen über App und Mac funktioniert. Die optionale Fernbedienung ist eine sehr sinnvolle Erweiterung. Das *Schuberthisierte" Sena System passt perfekt in die "Buchsen" des C4. Die Steuerung ist allerdings sehr weit hinten am linken, hinteren Helmrand. Darum drängt sich der Kauf der dafür vorgesehenen Fernbedienung auf. Sena scheint der Marktleader und innovativster Hersteller von Motorrad Intercom. Aber vieles steckt noch in den Kinderschuhen und funktioniert noch nicht so, wie propagiert. Allerdings, wird die Post abgehen, wenn mal alle Kinderkrankheiten kuriert sind. Auch das Koppeln mit fremden Produkten klappt erstaunlich gut, selbst wenn man einander auf der Strecke "verloren" und wiedergefunden hat. EL PRODUCTO EN SI CUMPLE CON LO ANUNCIADO, PERO LAS INSTRUCCIONES SON UNA TRADUCCION LITERAL, DIFICIL DE ENTENDER EN ALGUNOS CASOS Y DEMASIADO ENREVESADAS. NO HACE REFERENCIA A LA FORMA DE CAMBIAR EL IDIOMA DE AUDICION, POR LO QUE HAY QUE BUSCARSE LA VIDA. Very good audio performance , compact and simple. Very easy installation and quick setup. The sound in my Schuberth C4 helmet is excellent. Have had issues with the intercom disconnecting sometimes but nothing more than a minor nuisance. Battery life brilliant. I've also bought the battery charger so it's quite easy to swap batteries. While listening to the radio (only in the 'advanced' model) it sometimes disconnects. Easy to set up, and with no external module it looks great. One of the best features is the removable battery that can be charged separate from the helmet, and a second battery can be carried and swapped out to extend the life of the system. The system also provides excellent clear phone calling just like if I were in my office. - quick and stable connection with phone/gps etc. (may be in app). Price is too high for this processing quality. I haven't had an opportunity to use the helmet to helmet communications yet but the phone connection for music and phones calls works well. The unit itself is very easy to install but if you wear gloves while riding it is hard to feel the buttons to make adjustments. But I guess that is why they make a remote control accessory. I purchased the SC1 Advanced communication system last month. The installation to my Schuberth C4 was very easy and the performance is great. The phone calls are clear to me and also to the caller, even at speeds over 100km/h. In the city where I use the radio all the time and quality is very good. I have not used the intercom function yet, but I see no reason why it shouldn't work very well. Das Kommunikationssystem fügt sich sehr gut in den Helm ein. Die beigefügte Bedienungsanleitung hat zumindest für mich nicht ausgereicht aber man kann ein ausführliches Handbuch bei Schuberth downloaden. Die Verbindung mit meinem tomtom funktionierte erst nicht, deshalb habe ich eine Firmware Aktualisierungen durchgeführt und konnte dann auch die Sprachausgabe auf Deutsch ändern. Das gleiche habe ich mit meinem Navi und auch direkt mit dem Handy und danach funktionierte die Verbindung tadellos. Was mich stört ist die Bedienung während der Fahrt. Die Tasten sind sehr klein und weit hinten am Helm. Mit Handschuhen kann ich sie gar nicht bedienen und ohne Handschuhe nur sehr schwer. Da könnte die Fernbedienung Abhilfe schaffen aber dafür werden dann nochmal 89 € fällig. Lieferung kam schnell und gut Verpakt bei mir an. Der Einbau in den Helm funktionierte ausgezeichnet und ohne Probleme. Als nächstes kam die verbindung zum Handy und dann mit dem Navi beides klappte hervorragen und sehr schnell. Die ersten Tests liefen gut nur Fahrtest habe ich noch nicht durchgeführt. Boutons durent à appuyer. Il faut ressortir le boitier en cas de faux contact (le voyant, lors de la charge passait au rouge puis au vert etc). Pas évident de passer du mode radio à la musique sur le téléphone. La batería no dura lo que dice. En dos días se ha ido. Por lo demás bien. The communications performs as expected. It connects easily with phones and GPS units. The installation was very easy and the instructions were straight forward. I have not connected to other systems but I expect that the unit will perform as expected. A very useful communications system - the sound quality is very good and phone connection is easy to understand. The music and FM radio quality is very good. I have no hesitation in recommending this product. Wygodny w użytkowaniu, trzeba zapamiętać kilka funkcji, w połączeniu z Iphone, jest problem z odbiorem muzyki, ale to norma, bo w innych urządzeniach też występuje ten sam problem. I have used this in conjunction with a Sena 10s which is very similar in its range of functions. The 10s however uses a jog dial while SC1 advanced only has two small buttons, which to be honest are hard to operate with gloves on. That said pairing devices was quick and simple (once you have figured out to get to the configuration menu) and the comm. is crystal clear. Many functions are done with voice command anyway (speaking loudly into the mic.) I often just set-up what I want at the start of the ride, music, sat-nav, intercom and then leave it. Anything beyond volume control is just too dangerous in my opinion to do whilst riding the bike. I often do my phone-call to say I'm setting off with my helmet on... But I would never attempt to make a call, even using the speed dial, whilst riding. Same goes for changing radio stations. Would love to be able say 'ok google' and let my phone do the voice recognition work. That said, my R2 is the complete package with it and I would buy again if my modular helmet gets replaced by a C4. Хорошее качество звука. Не очень удобное нажатие на кнопки. Маленький размер кнопок требует длительного привыкания. Pequeño, manejable, perfecta integración en el casco Schuberth C4; con radio FM, buena conectividad con móviles y con el sistema Connected Ride de BMW, y el sonido multimedia es de calidad. Como pequeñas críticas, la utilidad para PC debiera ser más amigable, y hay que trabajarse el funcionamiento del dispositivo, pero esto es normal al ser algo tan pequeño y disponer sólo de los botones + y - para manejarlo. Por último, precio adecuado y envío perfecto por parte de FC Moto. A little difficult to get all functions working at first especially the radio but the user manual is clear. Everything works as it should and the radio is excellent. It is worth paying the extra for the advanced system which has FM radio. Vadí mi, že ovládání není moc intuitivní, bez návodu se zřejmě neobejdete. Dále po zapnutí je nastavena plná hlasitost, po naběhnutí je už nastavena nižší. Jinak funkčně fungují velice dobře.